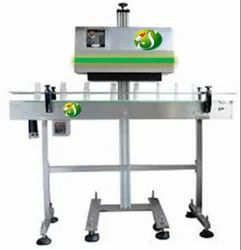 Leading Manufacturer of induction cap sealing machine and auto induction cap sealing machine from Ahmedabad. Capacity 30 TO 40 / MIN. This machine is used where the production is less. 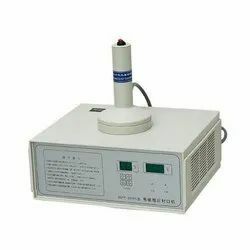 It is manual Induction capping machine. We have to put the bottle at the center of the sealing head & switch on. The Induction cap will be automatically stick on the neck of the bottle. Production Capacity: 20 TO 40 BOTT. / MIN. Capacity 40 TO 80 BOTT. / MIN. Conveyor Speed 100 BOTT. / MIN. This Induction cap Sealing machine ( MODEL NO. – SICM-100 ) is used to seal the Induction cap on to the bottle neck. After the capping the bottle goes to induction machine conveyor belt. Where it travel through the conveyor under the Induction head & induction cap was automatically sealed on the neck of the bottle , which was earlier fitted in the bottle cap. The fuction is complete through the electro magnetic vaves & the product in the bottle will not be affected through this processs. · USED IN PHARMACEUTICAL INDUSTRIES. · WORKING OF MACHINE: LEFT TO RIGHT. · MATERIAL: S.S. 304 CONVEYOR BELT. · OUTPUT : 40 TO 80 BOTT./ MIN. · POWER REQUIREMENT : 2 Kw. · POER SUPPLY: 220 VOLT, SINGLE/ THREE PHASE, 50 Hz.